Weekends spent in Pittsburgh, few and far between as they are, tend to line up in a course of habit and ritual. If it’s baseball season, there will be a pilgrimage to PNC Park. Whether it’s the fact that I haven’t seen the trilobites lately or that there’s a Duane Michals show on view, it’s not hard to find an excuse to end up at the Carnegie Museum of Natural History or Art. And no matter how many restaurants, bars, and sandwich shops still left to try, I always make time for a burger and a cocktail at Butterjoint with my sister. The story of Butterjoint starts with Legume, one of the first wave of farm-to-table restaurants that spearheaded Pittsburgh’s culinary revitalization. Legume started in a teeny bare-bones space on Braddock Ave. in Pittsburgh’s Regent Square (now occupied by Root 174, part of Pittsburgh’s second culinary wave). A few years ago, when Legume moved to a bigger space in Oakland (conveniently, for me) near the Carnegie Museums, they also acquired the throwback bar next door. Like sisters, the two spots are connected, but have distinct personalities. 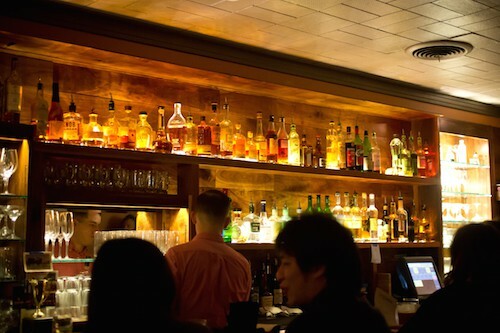 They share an entrance—turn to the left, and you’re in Legume, turn to the right, and you’re in the bar—and a kitchen. Butterjoint still serves in its original capacity as the main bar for Legume: all cocktails for the restaurant come from this side of the space, and are shaken, stirred, and poured at the long polished wooden bar that stretches almost the full length of the cozily lit room. Nailhead-finished leather seats at the bar, brass sconces, and terrazzo floors remind me of so many old-school Pittsburgh bars; touches of quirky contemporary art like a swarm of crocheted jellyfish above a back corner booth keep things from getting too serious. 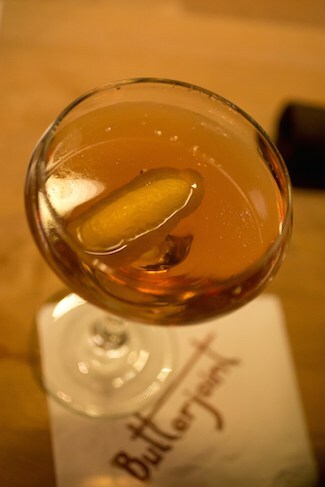 Butterjoint’s cocktail list doesn’t span pages and pages; it’s a list built to encourage sampling while you share a bite or are just popping in for a quick drink and a chat. A few classic options like the Sazerac and Negroni, and simple but balanced house inventions like the Beleriand, featuring fino sherry, blanco vermouth, and sour cherry brine. (Sour cherry brine. Yes. That.) A dozen or so draft beers and an equal number of wines by the glass round out the selection. The food menu is just as sparing but specifically chosen as the drinks: a few appetizers, pierogies with a handful of traditional and modern sides like sauerkraut and braised kale, burgers, and desserts. Despite this pared-down selection, it’s still hard to make a choice. (If you want something fancier, you can order from the regular Legume menu at Butterjoint, but I highly encourage enjoying the ‘joint on its own merits.) 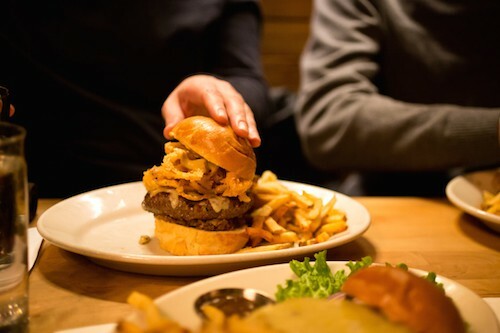 The reason I find the decision so difficult is that I know the burger will take up all my available stomach space, and despite my love for shared plates of pickles, cheese, and pierogies, I selfishly find the burger unshareable and need it all to myself. I first encountered the rhubarb ketchup as a topping on one of Butterjoint’s “fancy” burgers, which change frequently—on this last visit, the fancy option was topped with crispy onion rounds, der Alpen Kase cheese, mushrooms, and horseradish-worcestershire aioli—and which, at some point over the past year or so, got officially fancier with their own bun branding. 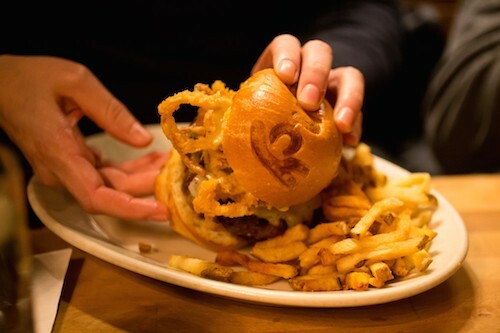 It’s easy to recommend a place to grab a burger and a drink in almost any city in America these days; it feels like a cop-out in some ways, but I’m happy to have no shortage of quality spots to do so. And though there’s also no shortage of exciting, worthy, and inventive new places to eat and drink in Pittsburgh, Butterjoint remains more than deserving of repeat visits. I’m happy to be a creature of habit here. 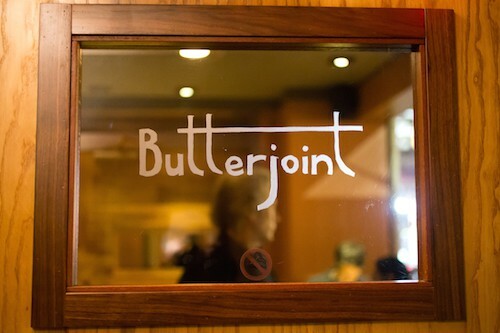 Butterjoint, 214 N Craig St., Pittsburgh, PA. 412-621-2700. Closed Sundays.